The Institute hosted its second regional trade summit of 2018 in Edinburgh in April – the first time the summit programme has been taken to Scotland. As ever the day was full of engaging presentations and debate around the opportunities and challenges faced by the region’s exporters. The Edinburgh summit – more than any of our previous summits – drew on the experiences of companies who are already out there doing the job of exporting, with three case studies and the Scotch Whiskey Association all sharing stories of Scotland’s finest exporters. 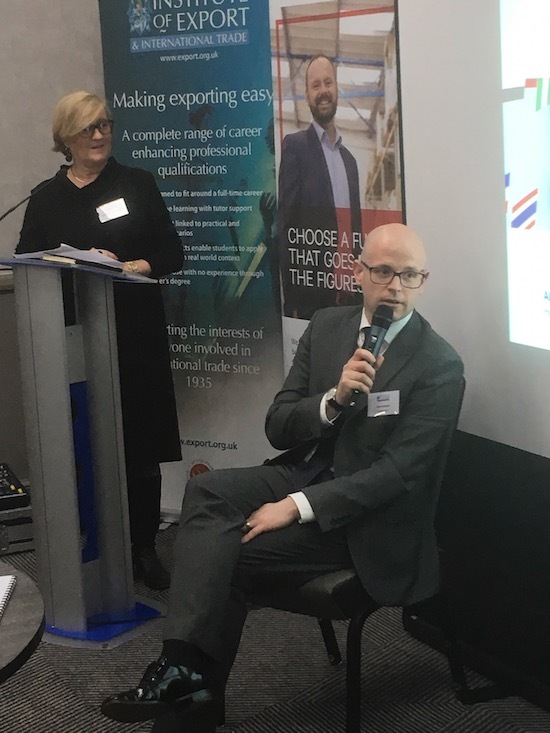 The event was kicked off by our very own Director General, Lesley Batchelor, who repeated the key message that the Institute is trying to convey this year, about the need for UK companies to learn the skills of international trade being greater than ever due to Brexit. Her presentation, titled ‘International Trade – it’s easy when you know how’, highlighted the highly international nature of supply chains and the significant impact that changes in customs requirements after Brexit could have. The summit showcased some of the support on hand for preparing businesses for the change ahead. Suzanne Sosna from Scottish Development International (SDI), John Brown from UK Export Finance, and Joanne Hills from Royal Bank of Scotland each discussed the support on offer for Scottish exporters from the private and public sectors. Suzanne in particular highlighted the fact that the number of companies in Scotland exporting is lower in percentage terms than in the rest of the UK. There are some great Scottish companies paving the way for more to follow and three featured as case studies at the summit. ARX Maritime – members of the Institute – Supagard and Scotmas all discussed the different approaches and challenges they have faced on the way to export success. Steve Regis from ARX – who deliver innovative products and services to prevent risk and loss of life and cargo in the maritime industry - noted that international trade is fraught with risk but suggested that the support on offer from organisations like the Institute and SDI makes this risk navigable. Meanwhile, Alan Graham (Supagard) and Derek Cameron (Scotmas) both discussed their different approaches in a panel discussion. Supagard – who produce one of the leading car care product ranges in the world - now carefully plan their export strategies, having realised that they couldn’t do it sustainably with a more reactive approach. Scotmas, meanwhile, due to the industry they operate in, as one of the world’s leading chlorine dioxide specialists, have to be more reactive due to the larger nature of the deals they are trying to secure. The panel signalled, perhaps, that there is no one size fits all solution for when it comes to how best to do international trade. Alexander Jupp, from the Scotch Whiskey Association, had plenty of success stories to draw upon himself, given that whiskey represents 20% of the UK’s entire food and drink exports. However, it is an industry riven with challenges, including import quotas in overseas markets, labelling requirements, significant counterfeit challenges, and advertising restrictions and bans, to name a few. Alexander discussed some of the SWA’s services in supporting exporters in the sector in dealing with these challenges. The other major theme of the summit’s presentations was the significant untapped potential that Scottish exporters can look to exploit in the years ahead, despite Brexit uncertainty. 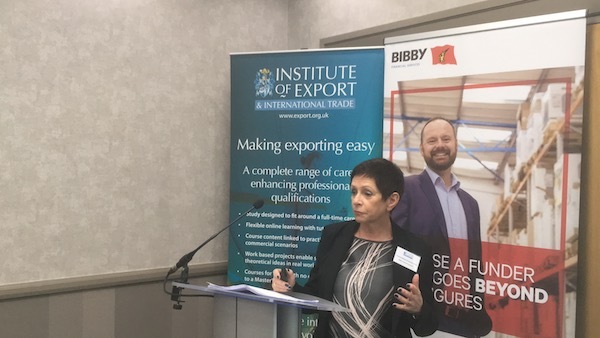 Yvonne Wedel-Andersen, from summit sponsors Bibby Financial Services, was keen to point out the gap between there being 322,000 exporters in the UK and only 8,200 exporting companies using invoice financing support. 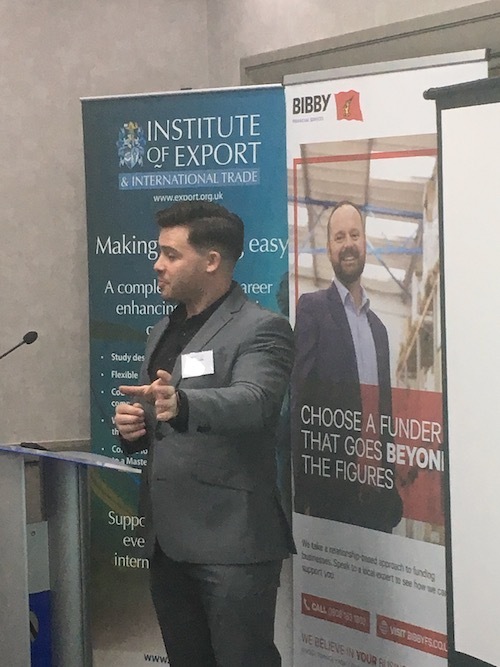 Yvonne demonstrated some of the support provided by Bibby, including invoice financing and currency support, in their efforts to help both increase the number of exporters in the UK, and also to help more of the companies already exporting to do it better and more profitably. Emil Stickland and Dr Peter Mowforth from the Institute of Ecommerce passionately argued the case that the UK’s exporters should do more to embrace the opportunities out there in global ecommerce. And finally, Grant Thornton’s James Andersen discussed how a collaboration network, matching larger exporters and smaller firms, could be a solution for helping more SMEs take the leap into international trade. There was once again a shared enthusiasm and sense of ambition on show in Edinburgh for the opportunities out there in international trade. But returning to the key point made by Lesley again, companies will only be able to succeed in trade by drawing on the wide array of support that is out there, and by learning the skills of doing trade properly.